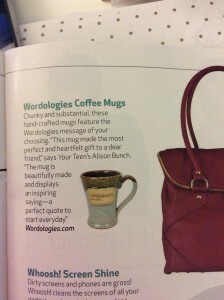 Congratulations to our Client Wordologies for their feature in Your Teen Magazine! Double your morning perk-up. Add punch to your afternoon tea. Best of all, glimpse a quiet reminder to live well before each sip with a Wordologies Coffee Mug! Wordologies brings everyday products a new purpose. Their collection of candles, journals, notepads, coffee mugs and magnets inspire with a meaningful Wordologies message. 5% of proceeds are also given back to Women for Women International,Â an organization dedicated to advancing womenâ€™s health and well-being by offering business and job skills training to women in conflict-ridden nations. Feel good and do good. Check them out at wordologies.com!